Boost was hitting 30psi then it dropped off to 25psi at top end due to the small 42mm wastegate. This is on a LT10s with no upgraded map sensor. Motor was revved to 8000rpm. Rev cut 8000rpm.. I will post up the dyno sheets and some videos in a couple of days when i get them. Car will be raced in a weeks time. The owner said it had over 10 full dyno runs with no problems what so ever. Any questions please feel free to ask. We need more E85 cars like this on the road! what was your injector duty cycle? I haven't seen the car yet... but the owner said timings on 15 degrees. He doesn't know what % the injectors are at. 45psi map sensor upgrade and more tuning in the next month. What time did he run exactly? The car did not have a clean run (10.2 was the quickest of the day) ... its running 26x10 inch slicks, toyota supra w57 box and bent the wheelie bars like a banana on the first pass. Before the computer gets sent out I'll go past and see what the timing really set at. Good looking car mate. But no way he's getting 670rwhp on 4x1680cc injectors. He needs min 6 injectors to do this. I managed 530rwhp on 4 1680 injectors last year with E85 and we where at 98% duty cycle then. We raised the base fuel pressure to 45 psi and it dropped to 95%. So no way he's getting that amount of power with only 4 injectors. He uses 2 x 044 fuel pumps, that's 106 GPH at 73 psi! So it will still limit the amount of fuel on the injectors even tho the injectors will deliver more fuel at higher pressure. I have a Aeromotive Pro Series fuel pump that delivers about 1000 lbs at 60 psi. And i was running a static pressure of 45 psi at 0 boost. So it increased about 21 psi from 0. So at max boost i was running 66psi of fuel pressure. So that's about 145-160 gph at 66 psi of fuel pressure. So don't think that's the problem mate. It's basicly 4 injectors can't deliver enough fuel on E85 for that amount of HP. 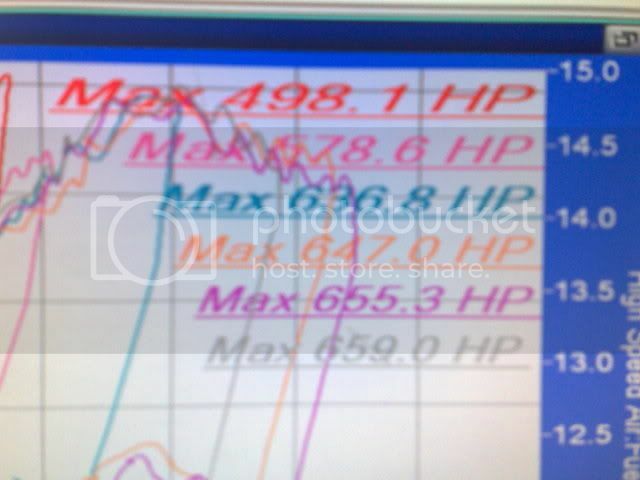 530-550rwhp is about the limit on 4x1680cc injectors. If u look at more posts here u will see the same thing, they can't do more. there are 18,400 BTUs in a pound of gasoline. alcohol delivers 9500 BTUs per pound. from the above you can see it takes 1.93 pounds of alcohol to deliver the power in one pound of gasoline. it takes 3773 CC/Min at 11.3 AFR to make 500 rw rotary hp on gas. it takes 7281 CC/Min to make 500 rotary rwhp on alcohol. 4 X 1680 = 6720 at 100% duty. to make 500 rw rotary hp. maybe if you run the injectors static open and crank up the pressure... run them sort of like nozzles... til they overheat. if you were to double the pressure you would get a 10% increase in flow volume. i guess you guys didn't see the e85 dyno chart/post in the single turbo section. check it out. Mate have a look at howard colemans post abit up. He explains it quite simple with his calculations that it is not possible what he is claiming. U will max get about 550rwhp with 4x1680cc injectors with increased fuel pressure. Bit there is a limit on how much the injectors will flow. It's as simple as that. Boost was hitting 30psi then it dropped off to 25psi at top end due to the small 42mm wastegate. Boost drops when there's a restriction in the exhaust or your overspinning the turbo..
Im only posting what the owner told me over the phone. He ended up buying a 60mm wastegate and smoothing the insides of the manifold with a die grinder . 2inch ID manifold with about a 90 degree bend going to the wastegate. 3 1/3 inch exhaust. t6 1.05 a/r exhaust housing. I'll keep everyone updated in around 1months time after the new tune. Right, I just posted the numbers cause it changes a few of the calculations of HP for an injector size. he also needs to run colder spark plugs . Its got a 60mm wastegate now.. It had a 12psi spring in the old 42mm wastegate 1st, 2nd, and 3rd gear was hitting 12psi and 4th was spiking to 30psi then dropping off to 25. It has no tap or boost controller. They never knew what the injector cycle was at cause they never monitored that But going from other posts on here maxing out at 550hp... must of been the reason why it never ran properly when in 4th gear -farting and popping and melting the plugs, so it must of been very very lean. It did make 670hp on the dyno with the manifold glowing red hot but when he ran it at the track it never ran properly in 4th gear. He is running 15 deg advance, and he is retarding 10Deg at 25psi? or at 15? or what? Doesn't this mean he is running at 5Deg advance actual timing and this is pretty conservative for a E85 rotary, right? I am running e 85 25 advance with a Tmap of -17 above 16psi which puts me at 8deg actual advance with a split of 8 going down to a split of 6 towards the upper rpm range but my engine is a renesis which is 10:1 compression. I am running an lt10s with ls2 coils and I boost up to 20-21psi due to the fact that my Microtech only goes up to 20psi. The turbo is a Precision turbo PT71GTQ...2 X -044 pumps with aeromotive regulator, 2X 720cc Primaries, 2X 1000cc Primary 2's and 2X1680cc Secondaries(renesis has 6 injectors total). Also if he is running 5 deg actual advance, 10deg of gap would put him at -5deg for the trailing, is this better?, worse? Am I pushing mine too much...Any thoughts..
Great numbers by the way .